Discontent with the Obama administration's "abominable" policies toward Egypt among some of his leading supporters on Middle East issues took center stage Friday afternoon during a panel discussion sponsored by the Center for American Progress (CAP). The program on "U.S. Engagement with the Egyptian Muslim Brotherhood" featured James Zogby, founder and president of the Arab-American Institute; John Esposito, head of the Prince Alaweed bin Talal Center for Christian-Muslim Understanding at Georgetown University; and Michael Hanna, senior fellow at the Century Foundation. Each expressed concern with the Muslim Brotherhood's rejection of women's rights, hostility and violence toward Egypt's Coptic Christian population, and repression of dissent and "incompetence" since the party came to power last year. This criticism is noteworthy given that each speaker admitted having had high hopes for the Brotherhood a year or more ago. Egyptian human rights abuses have been so grave that even Esposito, one of the Brotherhood's most redoubtable defenders in America, took issue with the Obama administration's Egypt policy. "The answer here is obvious," Esposito said when asked about last Sunday's siege of the Coptic Church's holiest cathedral by Islamic extremists and Egyptian riot police that left two dead and over 80 injured. "The administration should be very strong in responding to that kind of incident because this is not an incident where we want to say that, 'Oh, we are not going to intervene in Egyptian politics,' where certain segments of the Egyptian population will say 'there goes the U.S. intervening.'" It should be met with very strong statements publicly, but also privately when talking about potential economic assistance." Esposito's recommended course of action stood in opposition to the State Department's actual response at Monday's press briefing when acting spokesman Peter Ventrell called on "restraint from all sides" without acknowledging that the Islamists caused the siege. CAP was founded by former Clinton Chief of Staff John Podesta in 2003 as a left of center answer to the conservative Heritage Foundation. The group has been extremely influential with the Obama administration and with Democrats in Congress. Zogby suggested restructuring foreign aid to Egypt to be more sensitive to the facts on the ground rather than the United States locking itself an agreement that is difficult to change over the long-term. Such a change would give policy makers flexibility so aid to Egypt isn't handled in all-or-nothing terms. "Our credibility has been compromised," Zogby said. "I think the way we handled the constitutional issue itself was abominable." U.S. officials made clear what a constitution should include, yet did not follow through when the document failed to protect women and minorities. "I can't believe that we did nothing with regard to the communities in Egypt that were going to be affected by that constitution and express that we were displeased by the direction." The Brotherhood's rejection of equal status for women and the Copts, as well as its repression of opposition, have damaged its image, Zogby said. "If they had pulled it off – if they had dialog after winning the parliamentary elections and not run for president and said, 'We are all in a deep crisis, and we've got to move forward in a collective manner to solve the problems facing our country,' I think 'Brand Brotherhood 'might be different," Zogby said. "But today 'Brand Brotherhood' is being tarnished." Washington's hasty embrace of the Brotherhood in the wake of Mubarak's fall fit a long-standing reflex, Hanna said. For decades, "competent repression" has been the norm in the Middle East. That led many U.S. diplomats to view the Brotherhood's Freedom and Justice Party the same way it had viewed Mubarak's National Democratic Party. "We go to the Muslim Brotherhood because they are the guys who are in charge, and that sends out its own set of signals to opposition Egyptians," Hanna said. "That was an assumption of Egyptian politics that I think is flawed in the sense that the Muslim Brotherhood is going to win elections. "We need to be cautious in thinking that the Muslim Brotherhood is the new political equilibrium because you see a lot of dynamism." Michael Meunier, president of Egypt's al Haya Party that is part of the opposition National Salvation Front in Egypt, praised the panelists for having a change of heart on the Brotherhood. "I think it validates what we have been saying," Meunier told the Investigative Project on Terrorism. "The fact that the left started saying this proves we have not been exaggerating … what has been happening to us in Egypt from the Brotherhood rule." The panelists' comments prove that the Obama administration has mishandled Egypt. "It's very clear cut when it comes to our values," Meunier said. "We are giving up American values to support the Brotherhood." You couldn't have picked a better comparison of Zogby, Eposito, or Hanna to being as credible as Goebbels & Himmler after all the muslim faction(Mufti) were in collusion with Hitler in World War II. I have voted Republican & I will again. The comments by Zogby, Eposito, or Hanna are merely taqiyya posing as damage control. . As it stands, they're about as credible had Goebbels and Himmler hosted a panel discussion about the Nazis' "image" problem. In the 19th Century the European states propped up the Turkish Empire to the detriment of its Christian inhabitants. At that time too, there was some pressure for the Muslims to treat Christians as equals. In 1878, in order to prevent the expulsion of the Turks from Europe by the Russians (and to deny the Russians access to the Mediterranean) the Great Powers promoted the Treaty of San Stefano whereby Christians would have the same rights as Muslims in Turkey. Well, we know how that turned out...we had the pogroms against the Armenians in the 1890s, and final extermination of Christians throughout Turkey in the period 1915-1923. The treaty was neither signed nor honored, in part because it called for Muslims to ignore injunctions on how to treat dhimmis or infidels. The writers cited above make the same mistake, and as usual someone else will pay the blood price for their actions. Too bad this criticism didn't come before we shipped over all of those F-15's and the millions upon millions of dollars. Not that these opinions will count. Obama's narcissism won't deter him from his mindset. Rossomando wrote: "The Brotherhood's rejection of equal status for women and the Copts, as well as its repression of opposition, have damaged its image, Zogby said." Isn't that "image" as devious and dissimulating as the Brotherhood wishes it to be in order to enable the U.S. to help destroy its "miserable house"? Doesn't it conform to the tactic of posing as a non-threatening force to beguile its critics? Why should anyone sympathize or empathize with Zogby, Eposito, or Hanna over their concerns over the "damage" to the Brotherhood's laboriously contrived image as a "positive" force for "change" anywhere, whether it's the Mideast or the U.S.? Sorry, but I'm not buying the idea that Zogby et al. are really concerned. They'll merely redouble their efforts to make the Brotherhood seem "respectable." From where I sit, that panel discussion is merely taqiyya posing as damage control. 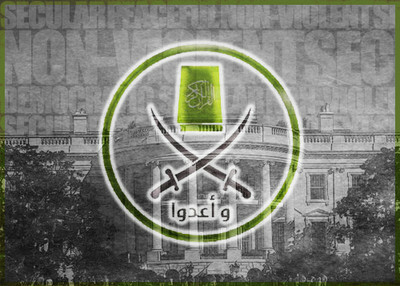 The Brotherhood's means and ends will remain the same, one of which has been to infiltrate the U.S. government on virtually all levels, from the White House to the DOD. If Zogby et al. had announced that the Brotherhood should be repudiated and disbanded, then I'd believe him. As it stands, they're about as credible had Goebbels and Himmler hosted a panel discussion about the Nazis' "image" problem.